The Shabby Stamper: Henry Says! I love this stamp set from SU! 's Occasions mini -- there are so many things that you can do with it! I stamped Henry on a design from the More Amore dsp, which included a sentiment already printed on the sheet. Behind Henry is a doilie heart cut from the sheet of laser cuts in More Amore. 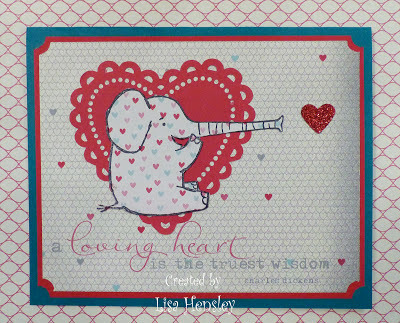 The heart was cut out using the small heart punch from red Glimmer paper.